We in Namibia strongly work to reach inclusivity because we believe it is the best way of bringing harmony into society. We need to learn to work together as a whole world. We are a country that likes to build bridges around the world. Bringing together people is the genius of the Portuguese. With good-will globalization is here to stay. José Manuel Barroso, Vice Chairman, Goldman Sachs International; Former President, European Commission, Portugal. We need to connect with the needs of the people... we need to build a narrative around people’s problems, explaining the trade-offs and being clear and transparent about the solutions and upcoming difficulties. We need competence-based education in Latvia and the European Union, which includes team building, creative skills, community sharing, flexibility and mobility. A strong EU is necessary in order to maintain peace and reach stability. Exchanges are the agents of social and economic change. Globalization has completely different meanings in different regions. When we talk to our partners in Africa, all they want is a job, any job. We cannot use the same meaning in every part of the world. Horasis will convene the 2020 Horasis Global Meeting in Cascais, Portugal over 28-31 March. The annual Horasis Global Meeting is one of the world’s foremost gatherings of business and government leaders, offering an ideal platform to explore and foster cooperation, impact investing, and sustainable growth across the world. Under the theme “Developing Decisive Leadership through Times of Disruption”, the Horasis community of more than 800 selected world leaders (including several heads of governments and key ministers) will gather for an unparalleled experience devising novel ideas to sustain and nurture our development in the future. The 2020 Global Meeting will be held at a historic moment in which the world is facing existential conflicts and a void of leadership. Delegates attending are poised to discuss potential solutions and to propose pathways that lead to sustainable leadership on global and local levels. What does it take to be a responsible and effective leader in politics, business and society? Cascais is conveniently located 30 minutes from Lisbon Airport. With its enchanting location right on the Atlantic, it is one of Europe’s truly legendary resorts. 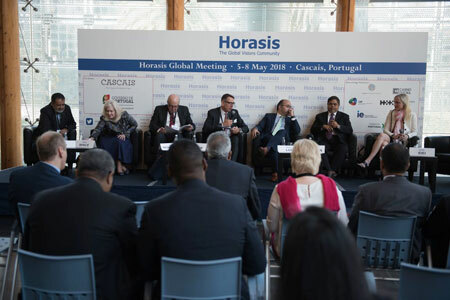 As in previous years, the Horasis Global Meeting is held in partnership with the City of Cascais and the Portuguese Government. Horasis – a global visions community committed to enacting visions for a sustainable future – provides a unique platform for companies from emerging and developed markets to globalize their organisations. In addition to the Horasis Global Meeting, Horasis hosts summits with a focus on China, India, and South East Asia.